MINSK, Belarus (AP) — A court in the Ukrainian capital Kiev on Thursday found former President Viktor Yanukovych guilty of treason and helping Russia annex the Crimean peninsula. The Kiev court began reading out the verdict in Yanukovych’s case, a process that is expected to take at least the whole day. The judge already declared Yanukovych guilty of treason and premeditated actions to alter the country’s borders, and will rule later on the other charges. 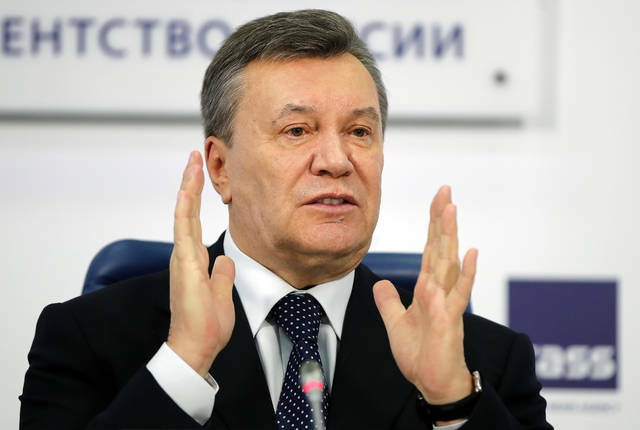 Yanukovych fled Ukraine in 2014 as tensions in Kiev flared up following a deadly police crackdown on protesters calling for the president to follow through with an association agreement with the European Union. Yanukovych eventually surfaced in Russia and was tried in absentia. The Kremlin has used a request by Yanukovych as one of the legal grounds to seize the Crimean peninsula and later formally annex it. At a United Nations Security Council session on March 1, 2014, a Russian envoy had read out a request by Yanukovych to send Russian troops to Ukraine. Yanukovych later said he did send a letter to Putin asking for military assistance, but claimed that that was not an official invitation for boots on the ground. The annexation of Crimea triggered hostilities in eastern Ukraine where fighting between Russia-backed separatists and government troops has claimed more than 10,000 lives. Earlier in the trial, Yanukovych testified via video link from Moscow. His lawyer has said that the former president would not be able to follow the verdict because he is in hospital after sustaining injuries on a Moscow tennis court in November. Prosecutors have asked the court to sentence Yanukovych to 15 years in prison. Disclosure statement: Sonja Dümpelmann’s book Seeing Trees was published with assistance from The Foundation for Landscape Studies and a Dean’s Annual Research Grant from the Harvard University Graduate School of Design. KINSHASA, Congo (AP) — Congo’s new President Felix Tshisekedi made news as soon as he was sworn into office on Thursday by announcing he would release all political prisoners and by praising his father, the late opposition icon Etienne, calling him “president” to cheers from the crowd. The 55-year-old Tshisekedi’s inauguration marked the Central African nation’s first peaceful transfer of power since independence nearly 60 years ago. He takes over from Joseph Kabila, who led the country since 2001. Kabila quietly watched from behind his mirrored sunglasses the extraordinary scene of an opposition leader becoming president. When Kabila left the dais, some in the crowd booed. Tshisekedi appealed for tolerance as questions remained about the disputed Dec. 30 election, calling national reconciliation “one of our priorities.” Congolese largely have accepted his win in the interest of peace. Despite the concerns, the new leader has inherited much goodwill with the legacy of his father, who pursued the presidency for decades but never achieved the post his son has won. The reference to Etienne Tshisekedi as “president” was a nod to the late opposition leader’s defiant declaration after losing the disputed election in 2011 to Kabila. Tshisekedi’s father had posed such a charismatic challenge that after he died in Belgium in 2017, Congo’s government did not allow his body to be brought home. His son’s spokesman has said that will be corrected soon. Supporters of the new president stormed the Palais de la Nation for a glimpse of the inauguration. Just one African head of state, Kenya’s President Uhuru Kenyatta, was seen at Thursday’s ceremony after the African Union and others in the international community expressed reservations over alleged election fraud. The United States and others this week said they will work with the new leader but did not offer congratulations. Many Congolese hope that Tshisekedi will bring change after Kabila, who in a final address on Wednesday night urged the country to unite and support the incoming leader. He said he was stepping aside with no regrets. Tshisekedi now faces the challenge of working with a legislature dominated by members of Kabila’s ruling coalition, likely restricting the chances of dramatic reforms in a country that remains largely impoverished and plagued by dozens of rebel groups. Few had expected an opposition victory in Congo, where Kabila had hung on for more than two years of turbulent election delays. Declared runner-up Martin Fayulu mounted a court challenge to Tshisekedi’s win, alleging massive rigging and demanding a recount. The Constitutional Court on Sunday rejected it. Outside court, Fayulu accused Kabila of making a backroom deal with Tshisekedi as it became clear the ruling party’s candidate did poorly at the polls. The new president saluted Fayulu in his speech as a “veritable soldier of the people” and acknowledged the Catholic Church, whose large electoral observer mission found that Fayulu had won. Observers have said Fayulu, an opposition lawmaker and businessman who is outspoken about cleaning up Congo’s sprawling corruption, was seen as a bigger threat to Kabila and his allies. Few Congolese have taken up Fayulu’s call for peaceful protest, appearing instead to accept Tshisekedi’s win as long as Kabila is on the way out. Congo will not be a nation of “division, hate or tribalism,” the new president declared. Congo has trillions of dollars’ worth of mineral wealth but the country remains badly underdeveloped, to the frustration of the population of its 80 million people. The new president briefly paused his inauguration speech, surrounded by concerned supporters, before resuming several minutes later and asking the crowd for its understanding. He cited a “small moment of weakness.” A number of people in the crowd earlier had fainted in the heat. The Associated Press will provide content (live, video, photos and text) from a deep-sea research mission that aims to unlock the secrets of the Indian Ocean. Scientists will draw additional data from precision instruments dropped to up to 2,000 meters (6,500 feet). There is currently very little comprehensive mapping or biological research of the Seychelles or the wider Indian Ocean below 30 meters (100 feet). The diving vessel Ocean Zephyr, which will be the mission command centre, will be mobilised in Bremerhaven, Germany. AP will have onboard coverage and interviews with the mission director as the specially commissioned ship is readied for its voyage of discovery. Final preparations are made aboard Ocean Zephyr in Victoria Harbour, Seychelles, as it begins its expedition to map the huge expanse of water that two billion people living in coastal nations on the Indian Ocean rim depend on for survival. Coverage will include the search for previously unseen marine life and the hunt for underwater forests and submerged mountain ranges off the Seychelles. * The scientific programme planned is varied and to an extent weather dependent. Please note therefore that the mission timeline is subject to change. Disclosure statement: Joy Y. Zhang has received funding from the British Council, the Economic and Social Research Council, the Wellcome Trust in the UK, and la Fondation Maison des Sciences de l’homme in France. Partners: University of Kent provides funding as a member of The Conversation UK. Institutions that draw the public’s attention may also risk political embarrassment. For example, great promises of discovery may not materialise. And ethical concerns can turn out to be nothing. CNAS’s tightly controlled publicity of the Chang’e 4 mission could be seen an example of the authority’s caution against embarrassment in the case of a touchdown failure.